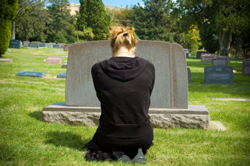 Six weeks after my father died, I lost my fifty-six-year-old husband very suddenly. My mother and I have often discussed how sad and strange it was to be widowed at about the same time. Because of factors like our ages, some issues we faced were obviously very different. But Mother and I also found many similarities in our journeys through grief. We all need physical human contact. Some of us were lucky enough to have a lot of that with our partners. When we don’t have that intimate contact anymore, the hunger for touch is even stronger. Those emotional expressions like holding hands don’t seem like much at the time, but without them a broken heart seems even emptier. Mother described that need very well when she told me how much she missed my father walking past her and patting her arm, or coming up behind her in the kitchen and giving her a bear hug. I know I particularly missed having my face touched, since that was something my husband did quite often. Nothing can replace that special touch from a lost loved one, but Mother and I both agreed that things like hugs from friends and family members can help ease the pain. I know we hugged a lot in our grief support group. Some physical contact is better than none at all. Like Mother said, a sweet little squeeze from a child or a touch to the shoulder from a friend is comforting. We both try to remember that when we encounter a newly widowed person—or anyone who has lost someone they love for that matter. Of course it is always a good idea to make sure the person dealing with grief wants that contact. But I have never had anyone surrounded by sorrow turn me down. So the next time you encounter someone who has just suffered a loss, remember to ask something like, “Can I give you a hug?” It has been my experience that most people will answer by grabbing you first. I thought the book was very beneficial. I work at hospice as a counselor and social worker. We sometimes get patients who are younger and we work with the spouse at the time of their loss.. This is a book I recommend to the young widows. This book shared stories as living proof that if worked through properly, grief will lead the way to a fresh new life. I also felt If gives the widow a sense of normalcy.